When the history of fantasy and horror fiction is being discussed, the pulp magazine Weird Tales is inevitably mentioned. Published on low-grade “pulp” paper, Weird Tales was the first newsstand magazine devoted exclusively to weird and fantastic fiction. It ran for 279 issues, from March 1923 to September 1954. One of the most important and influential writers to have their work published in the title was Providence, Rhode Island, horror writer H.P. Lovecraft. Weird Poems collects the author’s verse in the order that it originally appeared in the pages of “The Unique Magazine”. 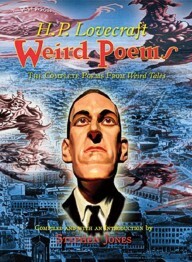 Weird Poems: The Complete Poems from Weird Tales. By H.P. Lovecraft, compiled and with an Introduction by Stephen Jones. Hornsea, England: PS Publishing; 2015; ISBN 978-1-848639-20-1; jacketed hardcover.